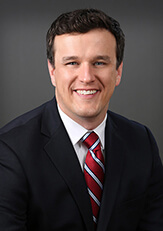 Rob Fafinski III practices in the General Corporate & Business and Mergers & Acquisitions practice groups at FMJ. Rob represents companies and investors in entity selection and formation, corporate governance and succession planning, business transactions, mergers and acquisitions, and general corporate matters. Rob also works in FMJ’s Real Estate practice group. Clients like working with Rob because he brings common sense and clarity to the table. After working as a Marine Corps infantry officer commanding platoons and a company on multiple, austere combat deployments to Helmand, Nimruz, and Farah Provinces in Afghanistan during 2009, 2010, and 2011, Rob knows how to work with people of all backgrounds and understands true leadership challenges. In addition, he understands that an effective lawyer must be humble while also being a powerful and efficient problem-solver. Prior to joining FMJ, Rob was an associate attorney at a large firm downtown where he spent the first years of his legal career in litigation defense on behalf of some of the world’s biggest companies. He knows the perils of expensive litigation and seeks to help his clients proactively avoid those pitfalls. Common Hope works in 27 communities helping more than 14,000 impoverished children and adults create a better life for themselves. The program focuses on education, healthcare, housing, and family development in Antigua, New Hope, and San Rafael, Guatemala. Growing up in the southwest suburbs of Minneapolis-St. Paul, Rob’s passions are kayaking, bow hunting, reading, and family. Outside of work, you’ll find Rob with his bow or shotgun in a tree or ground blind, paddling one of Minnesota’s waterways, or enjoying a beer with his Church friends. He is also an unaccomplished (and extremely amateur) powerlifter. Rob and his wife, Ali, have a daughter named Ada.